Tekken 6 boasts the greatest number of characters ever seen in a Tekken game. There are 41 characters in total, including 5 new characters - Zafina, Leo, Miguel, Bob, and Azazel. 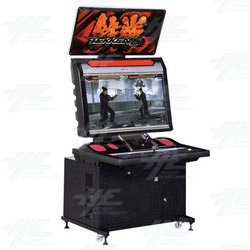 Tekken 6 is the first game to be released on Namco's new arcade board which is based on PlayStation 3 Cell Processor technology. The stages in Tekken 6 have been greatly improved, with some stages featuring multi-tiered levels and daylight/night-time transitions. The detailed character customisation options that appeared in Tekken 5 have been retained, with even more options and more items available in Tekken 6. You can customise your character by switching between available character costumes and items including various items like glasses, hats, and decorative swords. There are also character-specific items and pieces, as well as special items that unlock Item Moves once equipped. New to Tekken 6 are 'Item Moves', where a character can use an item to attack the opponent. Some examples of this are Nina Williams who can use one of her shoes and Ling Xiaoyu who can attack opponents with mittens. Also new to Tekken 6 is the 'Rage' system which gives characters more power, and is automatically activated when your characters health is low. Tekken 6 is the first game to be released on Namco's new arcade board which is based on PlayStation 3 Cell Processor technology. The stages in Tekken 6 have been greatly improved, with some stages featuring multi-tiered levels and daylight/night-time transitions. The detailed character customisation options that appeared in Tekken 5 have been retained, with even more options and more items available in Tekken 6. You can customise your character by switching between available character costumes and items including various items like glasses, hats, and decorative swords. There are also character-specific items and pieces, as well as special items that unlock Item Moves once equipped. New to Tekken 6 are 'Item Moves', where a character can use an item to attack the opponent. Some examples of this are Nina Williams who can use one of her shoes and Ling Xiaoyu who can attack opponents with mittens. Also new to Tekken 6 is the 'Rage' system which gives characters more power, and is automatically activated when your characters health is low.